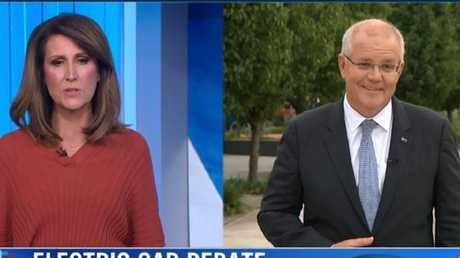 SCOTT Morrison snapped at Sunrise host Natalie Barr this morning - saying "I know my policy" - after she asked him to explain the difference between the Coalition and Labor on electric cars. The criticism of the Coalition has been that its electric car policy is almost the same as Labor's - yet the government appears to demonising the opposition over its position. Ms Barr asked him to explain the difference on Sunrise this morning. "You guys have stood there and said you're going to save the ute, you're going to be responsible for that," she said. "Where as, your electric vehicle policy is really the same as Labor's," she said. Mr Morrison, responded: "No, not at all." He said Labor's policy "rules out 17 of the top 20 selling cars in Australia today". "We support people getting electric vehicle have a policy to help achieve that what we're not going to do is have met a mandatory target that has to be 50 per cent," he said. "Now, 50 per cent within the next 10 years, that would wipe out half of the petrol and diesel fuel excise that is earned in this country. "My problem with Bill Shorten is that he won't explain his policy and he won't tell people what the impact is and that's why you can't trust him." However, Ms Barr kept pushing, saying his policy sounded the same as Labor's. "I know what my policy is, Nat," he snapped. 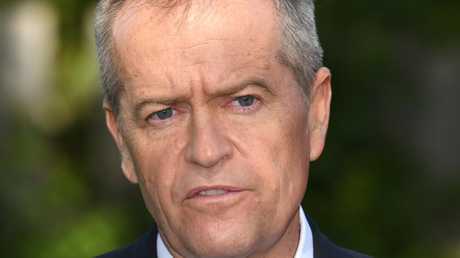 "That is the problem with Bill Shorten, he doesn't know what his policy is." Expect to see lots of politicians in high-vis jackets and kissing babies on the head, because the campaigning for this year's federal election officially kicks off this morning. 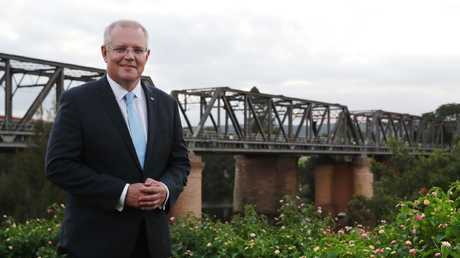 And, the Prime Minister has landed in one of the election's key battlegrounds to launch his campaign - heading for the banks of the Nepean River last night before doing live interviews from Penrith this morning. 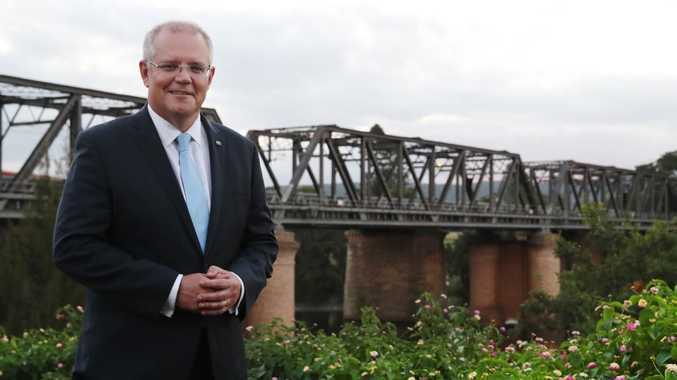 Scott Morrison jetted into the western Sydney seat of Lindsay on Thursday after visiting the Governor-General in Canberra and announcing Australians would head to the polls on May 18. 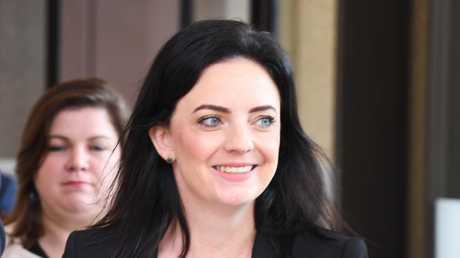 Labor only holds Lindsay by a margin of 1.1 per cent and the Liberals are hoping to reclaim what was a bellwether seat until Emma Husar won it for Labor in 2016. Ms Husar announced last year that she would retire after allegations of workplace misconduct, although an investigation later cleared her of bullying and sexual harassment. Now it's up to the new candidate, former NSW Labor minister Diane Beamer, to reclaim it for Labor. Despite the controversy surrounding Ms Husar, she did not seem to be front of mind for the voters news.com.au spoke to in Penrith on Thursday afternoon. Many seemed disenchanted with politics in general and not impressed by the Liberal leadership struggle. Several young men in particular said they only voted because they had to and didn't think about it. One 22-year-old Cambridge Park man said he would probably not vote for anyone, and most of his friends would do the same. "They're all the same," he said. "No matter what they say, everyone thinks they are lying." 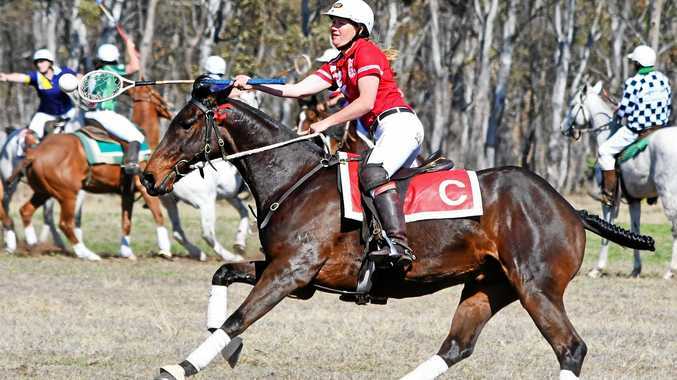 Another 31-year-old, Alicia Johnstone of Cranebrook also admitted to being disinterested in politics. "I usually vote Liberals because my parents have," she said. "I'm open but I definitely need to put more effort into figuring out what each side is offering." Interestingly, some residents who had voted Labor in the past, were intending to switch to the Liberal Party. While Liberal voters planned to switch to Labor. Mark Cashmere, of Glenmore Park, said he mostly voted Liberal but he was disappointed by the party's leadership struggles. "I thought we had got over that with Labor," he said. "I don't think the Liberals are really listening about cost of living concerns or listening to the people. "I think it's time to bring them down a peg." The 57-year-old said cost of living, power prices and refugees were the issues that would decide his vote. He said he was "fairly certain" he would vote Labor this year. "I don't think people are doing it easy," he said. "Many have nothing left after they've paid the mortgage and their living expenses." In contrast, Sheila Hamm of Leonay, said she would most likely vote Liberal, even though she mainly voted Labor. One of the biggest reasons she nominated was that she didn't like leader Bill Shorten - something that is seen as a problem for the party. "I think honesty is a big thing," the 61-year-old said. "I don't think Bill Shorten is honest, he seems less trustworthy, which may not be fair but we can only go on perception." Ms Hamm said she could still change her mind and nominated health and education as being the issues that would influence her vote because she works in the health industry and her daughter works in education. "The parties aren't as diverse in their views and policies as they were before," she said. "I think that's why people struggle to decide who to vote for because they are so alike." Sarah of Jordan Springs, who voted for Ms Husar at the 2016 election, described herself as a swing voter but said she would be supporting Labor again this year. "As much as I appreciate the surplus, I'm not happy with the current (Liberal) party's leadership changes," she said. The 27-year-old said policies for families and on penalty rates were important to her. "I also think Labor has done more than the Liberals in the lead-up (to the election)." Frank Willett, of Cranebrook, said he would probably vote for an independent conservative but then put the Liberal Party second. He said the most important issue to him was tax, including the changes proposed by Labor to superannuation, franking credits and capital gains tax. "They can spend money faster than I can make it," he said. 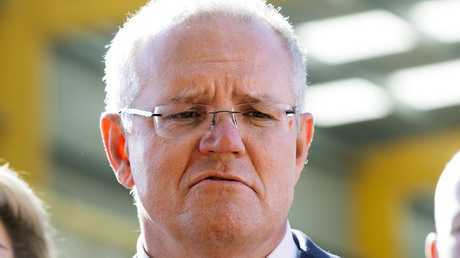 When asked what he thought about Mr Morrison, the 64-year-old said he was "all right" but doesn't think the Prime Minister has stuck his neck out enough. "I think there's a lot of things that could have been done," he said. But perhaps more importantly, he said: "I don't like Bill Shorten - put it that way". David McHugh, 59, of Werrington also had a very simple response: "I hate the Liberals and that's it". "I have been a Labor voter my whole life. I've never liked Liberal policies and how they get into bed with the Nationals to win." Bill Shorten is also campaigning in Sydney today and he spoke to the Today show about the choice Australians face on May 18. "I think Australians are sick of politics as usual, I don't view Australia as Liberal or Labor, I just view it as Australia and we have all got the same challenges. Everything is going up except your wages," he said. "We have had six years of massive instability in the Government and people just want to see proper investment in their kids' education, making sure when you are sick it's your Medicare card, not your credit card that determines your level of health. "They want action on climate change. We are about cost of living. That's why I started (campaigning) in a suburban backyard because that's where Australia is. "It's the families around the dinner table wondering what the future is going to hold and how Labor can help them look after their family and their health." 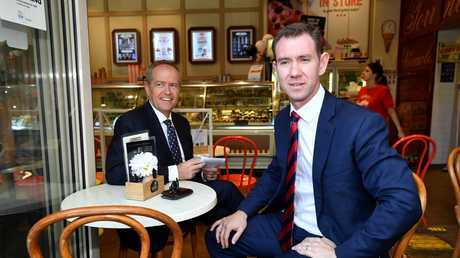 Mr Shorten starting with a visit to Sydney Markets in Flemington alongside Labor's high profile candidate for Reid, Sam Crosby. Reid is the electorate of retiring Liberal MP Craig Laundy, a Turnbull loyalist whose decision to quit has left the government deeply worried it could lose the seat. Scott Morrison's attempts to recruit a well known replacement for Mr Laundy fell flat. His advances were rejected by both former NSW Police deputy commissioner Nick Kaldas and broadcaster Stan Grant. Later this morning Mr Shorten will swing by PRP Diagnostic Imaging in Eastwood, where you can expect him to spruik Labor's policies for fighting cancer. Today we learned of a new addition to that plan. Should he win government, Mr Shorten will invest a further $125 million in funding for cancer research. A big chunk of that - $20 million - will go towards researching pancreatic cancer, which kills almost as many people each year as breast cancer. There are no clear systems and no early detection tests, and pancreatic cancer is resistant to conventional cancer treatments like chemotherapy and radiotherapy.